Very comfortable apartment, located on the first floor of the structure, consisting of: 3 double bedrooms, kitchen, living room, 2 bathrooms, furnished balcony. The apartment is ideal for families but also for three couples of friends. Washing machine for exclusive use, air conditioning, WIFI in the house and in the common areas. Sun terrace (on the third floor) ideal for an aperitif at sunset and to relax in the evening in an atmosphere of absolute relaxation. On the ground floor of the building, a large furnished garden. - transfer to and from Brindisi airport. In front of the apartment there are two supermarkets that are open all day during the summer. The distance from the sea to the center of Otranto is 300 meters! Upon request transfer to and from Brindisi airport, to and from Lecce station. What the accommodation lacked in facilities, it gained in the attention by our hosts. Erika was delightful and very happy to offer assistance and advice. Know that the apartment does not come with kitchen necessities like dish soap, olive oil for cooking etc. There are, however, several grocery stores within walking distance. The apartment does have beach towels, umbrellas and mats and the location is perfect. 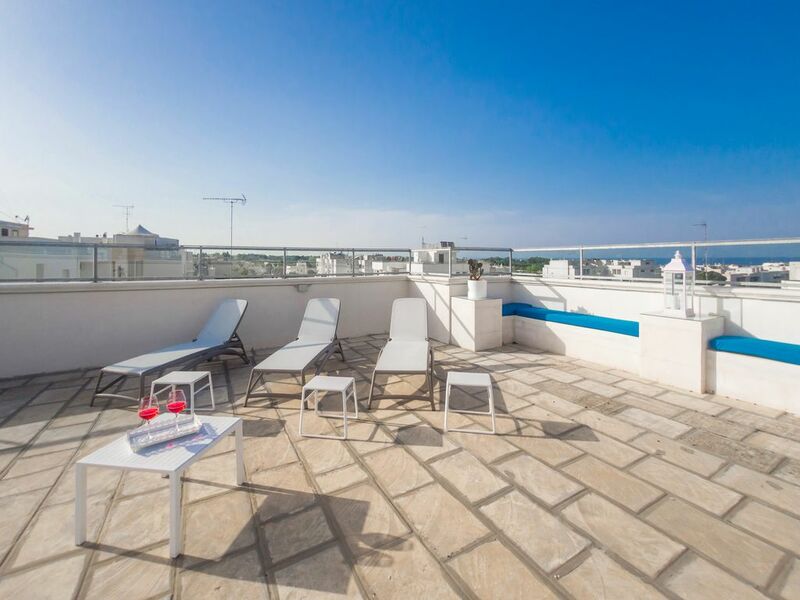 Just a short walk to the town Center and the roof top affords a wonderful spot for viewing the sunset and sunrise. All very clean and spacious. So handy for beach and restaurants. Nothing was too much trouble for Erika. What a lovely helpful person. Always with a smile!! Perfect place, only minor irritation is that WiFi is iffy. Didn’t matter too much to us but it might to others. Erika was a great contact, very helpful, was on site, downstairs. Flat was clean, good air con, most things you need. Would stay there again, absolutely loved Otranto. La casa è in una posizione ottimale fornita di tutto quello che serve. Spaziosa con un bel terrazzo. Grundsätzlich ist die Wohnung (Lage, Größe und Ausstattung) gut, wobei die schönen Fotos mehr erwarten lassen, da doch schon etwas abgenutzt. Eine großes Plus ist Erika, wirklich extrem nett und hilfsbereit. Leider müssen wir eine Stern bei der Sauberkeit abziehen, man bleibt mit den Fingern an den Griffen der Küchenschränke kleben und auch die Schlieren und Schuhabdrücke am Hochglanzfliesenboden sind nicht jedermanns Sache. Wir hätten uns auch schon auf ein paar chillige Stunden auf der abgebildeten Dachterrasse gefreut, die leider nicht vorhanden war. Aber vielleicht gehört sie auch einfach nicht zu der von uns gemieteten Wohnung mit den 3 Schlafzimmern und den 2 Bädern. Trotzdem können wir die Wohnung aufgrund der Lage und des Preis-Leistungsverhältnisses empfehlen. Nous n’avons pas pu accéder au logement prévu et nous avons été prévenu en dernière minute. Les raisons invoquées d’une fuite non semblaient improbables ( nous avons demandé à voir l’appartement ce qui a été refusé par la proprietaire). Après plusieurs heures de négociation nous avons pu avoir un appartement de remplacement à 22h mais n’ayant pas les caractéristiques initiales . Nous pensons que l’apparatement était occupé par d’autres vacanciers que nous avons croisé. Otranto, the easternmost city in Italy, throughout history has always maintained a very important role for trade and cultural relations with the East and the countries overlooking the Mediterranean, receiving also the rich artistic and cultural influence. Otranto has preserved and cultivated over the centuries a myth that stems from its history: the myth of its "martyrs", of which eight hundred Otranto in 1480, attacked by the Turks, defended the faith and homeland with the sacrifice of life, conquering not only a vast reputation in the news of the time, but especially impressing the memory of martyrdom in the tradition of their people every year celebrates them and renews the memory.